Deborah Milano 2-in-1 Long Lasting Eyeshadow With Primer ~ 50% OFF at Lifestyle. From Rs.450, so Rs.225 each . There are more shades available, but only these 2 shades were on sale - #4 Purple, #9 Gunmetal. They are cream eyeshadows. The texture is similar to the Bourjois Color Edition 24HR Cream Eye Shadows. Vero Moda Georgette Ruffle Dress in Festival Fuchsia ~ 70% OFF! From Rs.2695 to Rs.809. It's also available in a pale minty/pistachio green. For reference, my size is XS. I see it's sold on Jabong too - here. 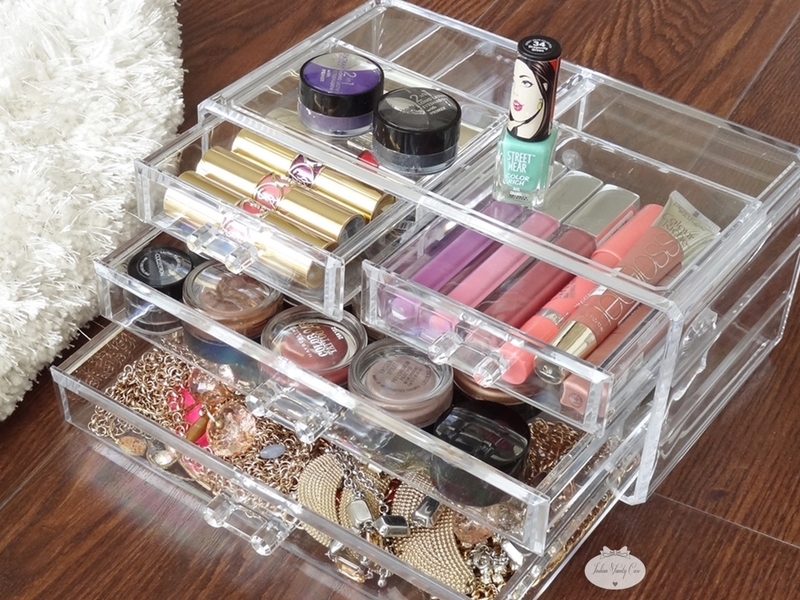 Jewelry/Makeup Organizer ~ 40% OFF! Even on Ebay, you will not get this for lesser than Rs.1500-2000. From: Lifestyle Home Centre. There are many many types available & on discount right now, including those open tray types like the one I got last time - posted here. Cosmopolitan Magazine July '14 Issue: I enjoyed reading this issue. Career Series topic this month - If You Want To Work With A Beauty Brand. Let me know if you're going to pick up any of these for yourself. Would also love to know YOUR best buys & bargains! Okies, now I gotta go munch on Baby CZ's favorite snack - Toast & Mixed Fruit Jam. For like 6-7 years I'd forgotten about jam, and now I have to eat it every.single.day. I mean just spread jam between two biscuit .. I am wondering why m writing all this here ? All these seem like a super bargain buy!! Loooooovvveee the dress!! That fuchsia dress is adorable! Thanks for the details dear.. I am gonna get that Mkeup organizer for me and those creamyeye shadows too.. 50% that's huge <3.. I Have been loving jams lately.. Looking for options other than kissan .. Any one u will recommend??.. Thats surely a super buy....the dress on 70% off is a steal. Interesting post. Loved the fuschia dress and that makeup organizer is simply awesome!! Keep posting Cynthia! Love your organizer ..! from where did you get it this cheap..i will buy one too ! !